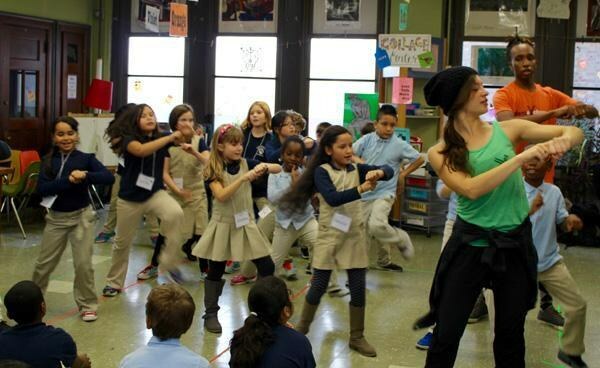 Dance eXchange teaching artists Ann-Marie Gover and David Irwin work with children of Andrew Jackson School in South Philadelphia. With its bright-orange ceiling, cavernous acoustics and basketball hoops dotting the wall, the basement gym of Andrew Jackson School in South Philadelphia is an unlikely dance studio. But thanks to BalletX, it becomes just that every Tuesday and Thursday morning when upward of 30 third-graders tiptoe through its industrial-strength doors. In its third year, the contemporary ballet company’s Dance eXchange program pairs teaching artists with local elementary schools in an inner-city district that is otherwise starved for arts programming. Students receive 13 weeks of instruction culminating in a series of showcase performances at Philadelphia’s Prince Theater. At the start of class, teaching artist Belle Alvarez requests “a nice Pink Panther theme” from her accompanist. Routine is paramount for these students, many of whom have never danced before, and the familiar tune sets the perfect tone for a quiet entrance. Each student wears a name tag and stands on a line taped to the gym floor. When they turn to face the back of the room, they’re greeted by one of Alvarez’s teammates, David Irwin: tall, sporting dreadlocks and ready to take up the charge. Dance eXchange follows the pedagogy of the National Dance Institute, which was founded in 1976 by New York City Ballet principal dancer Jacques d’Amboise. Having grown up in a low-income family, d’Amboise sought to create a curriculum that would inspire and engage all students through dance, regardless of their socioeconomic status, background or physical ability. Today’s class is no exception. While some of the students have dyed hair and sequined Ugg boots, others wear broken glasses and long-outgrown uniforms. One is being observed by a behavioral specialist. 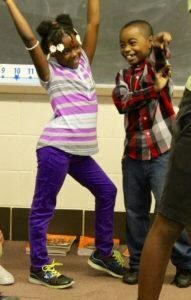 Many of the nearly 200 students enrolled in Dance eXchange are English language learners. Skipping to the center of the room, the 8-year-old leads her classmates through the “Motownphilly” routine they’ll be presenting to their parents the following week. 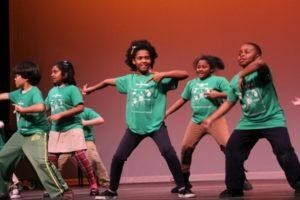 Albert M. Greenfield Elementary students perform at Prince Theater in Philadelphia. But first it’s time for “William Tell.” One by one, the students run down the aisle, up the steps and straight to center stage, where they perform their very best leap to a steady stream of cheers and applause. It may seem like an accident waiting to happen, but the teaching artist and company are strategically positioned to get everyone safely onstage and to their spots in record time. After demonstrating their warm-up sequence, jazz squares and all, each class performs its routine. There are no sequins. No tutus. Instead, it’s the third- and fourth-graders who light up the stage.